Reinforcing that the font of all true power in the Rajapaksa regime lies with the powerful Secretary to the Ministry of Defence Gotabaya Rajapaksa police sealed off the Mount Lavinia District court to media personnel a short while ago when the senior official was due to take the stand for cross examination. Secretary Rajapaksa filed a defamation suit against The Sunday Leader newspaper which exposed details regarding the controversial purchase of MiG 29 by the ministry of defence in 2007. DIG Anura Senanayake who was present outside the court house prevented journalists from entering to cover the court proceedings, which are a matter of public record and refused to permit photojournalists and cameramen from filming the Defence Secretary’s entrance to the court house. Even reporters who offered to leave their cameras and other recording equipment outside were not permitted entry. Similar scenes unfolded on May 28 this year when Gotabaya Rajapaksa entered the court to be questioned in the defamation case. In today’s proceedings the Defence Secretary is scheduled to be cross examined by the lawyer for the Sunday Leader, Attorney at Law M.A. Sumanthiran. This is the only case in which accredited journalists and court reporters are being barred entry to cover public court proceedings. 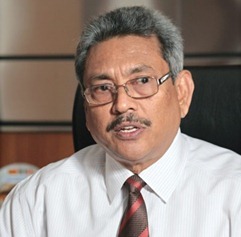 Defence Secretary Gotabaya Rajapaksa filed legal action against The Sunday Leader newspaper to prevent further exposure of the corrupt deal. The investigative reports on the MiG deal proved to be one of the last reports on controversial defence purchases under Gotabaya Rajapaksa’s reign in Sri Lanka’s mainstream press.